Ears of corn are brushed during grilling with a mixture of Dijon mustard, garlic, parsley and lemon juice for a flavorful twist on a summer vegetable. Preheat grill on medium heat. Combine mustard, lemon juice, parsley and garlic; set aside. 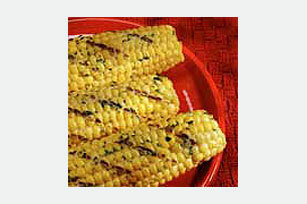 Grill corn 8 to 10 min. or until tender, turning occasionally and brushing with the mustard mixture. Substitute finely chopped fresh chives for the parsley. Prepare as directed, using 4 thawed ears of frozen corn. Prepare as directed, cooking the corn under the broiler instead of on the grill.